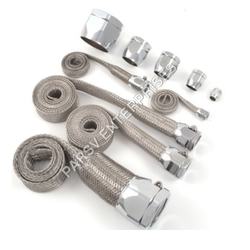 We are a leading Supplier & Manufacturer of Stainless Steel Hose such as SS Flexible Hose and Stainless Steel Braided Hose from India. We are manufacturers and exporters of Stainless Steel Flexible Hose, conforming to International Quality Standards. Our Stainless Steel Flexible Hoses conform to BS 6501 Part-I and are manufactured as per Type A, B and C flexibility. We also manufacture highly flexible closed-pitch hoses for special applications and P-type flexible hoses. They can be used for applications of various pressure ranges. Every stage of the production is closely monitored for quality. Diametre: 10mm - 19mm and other as per your required of size Pressure. 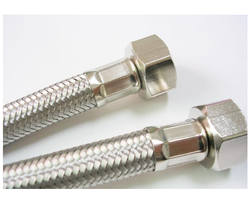 We manufacture braided Stainless Steel Hose and assemblies which come with the highest factory quality at a competitive price and quickest delivery. Drawing on our manufacturing capability and breadth of products, from low to ultra high pressure rated braided stainless steel hose; we provide custom fabrication to your specifications and requirements. Every batch is rigorously tested on all parameters of quality control and performance.